Geese and ducks raised for meat can be subject to the cruel practices of live-plucking and force-feeding for fatty liver (foie gras). Feathers and down are commonly used in outdoor wear, sleeping bags and home ware such as duvets and upholstered furniture. Brands that use down from geese and ducks in their products are starting to take responsibility for the welfare of animals in their supply chain. We take duck care very seriously and train our employees and partner farmers on the proper care and handling of ducks. We do not condone the mistreatment or abuse of ducks. Such actions are a violation of our company’s code of conduct and MUST be reported to management immediately. We are committed to using approved best animal care practices throughout all stages of production and processing to avoid mishandling ducks. In any case where these practices are not being followed, management is alerted so that corrective action can be taken. We will continue our support of research related to humane duck care and handling and incorporate this work into our well-being program. Our ducks are raised in quiet, spacious barns where they have room to roam about and have access to fresh water and feed. Duck barns protect the birds from extreme weather conditions, predators and disease, but allow the fresh air needed to keep our ducks healthy. Partner farmers check their flocks at least twice daily, carefully monitoring duck health, air quality and equipment. Each barn is thoroughly cleaned and sanitized in between each flock. Each farm is audited annually to ensure compliance with our stewardship program guidelines. 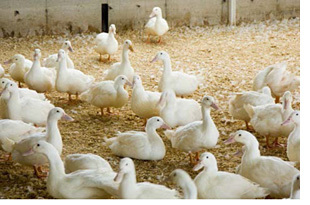 We own and operate our own feed mill to ensure the highest quality nutrition for our ducks. All of the family farmers we partner with use these natural feeds. A staff poultry nutritionist formulates a balanced diet for our ducks from corn, soy, wheat and other essential nutrients. Our duck feeds do not contain any antibiotics, growth hormones, or RUPPs (Restricted Use Protein Products) like meat and bone meal. Our feed mill holds valid certifications under the American Feed Industry.